BMN Bouwmaterialen (BMN Building Materials) provides products and services to construction workers for residential and non-residential construction. 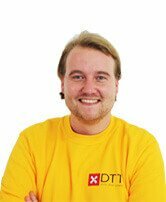 They are the market leader in the Netherlands with almost 80 branches across the country. 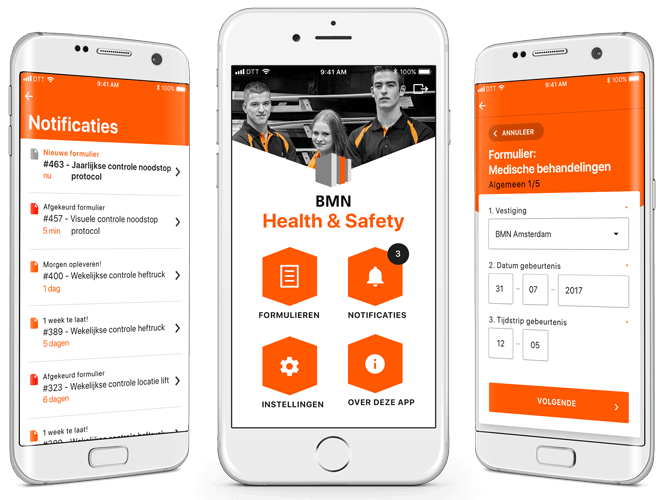 The BMN Health & Safety app will be their latest tool, allowing them to digitalize their auditing processes, with the goal to increase efficiency within the organization. Employees using the app will have quick access to forms, checklists, and other additional information, and can easily report incidents to management. The content available to the user depends on a user’s role. Furthermore, co-workers receive push notifications, which remind them of status changes and points of action. Management can view and assess completed checklists, forms, and incident reports in real-time by using the Dashboard. This data can also be exported as a CSV or PDF file. All users, user groups, forms, and checklists are manageable through the CMS, that also enables sending specific push notifications to selected user groups. If you want to know more about BMN, please visit their website. 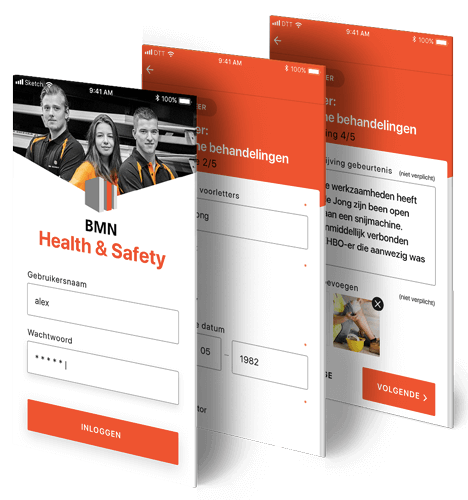 Login with your own BMN username and password. The main functionalities of the app at a glance. A clear overview of time-bound audits in chronological order. The color of the 'document' icon indicates the status of a relevant notification. Fill out forms in a quick and easy way. For example, in the 'medical treatment' report form, you can start with general information about the event. 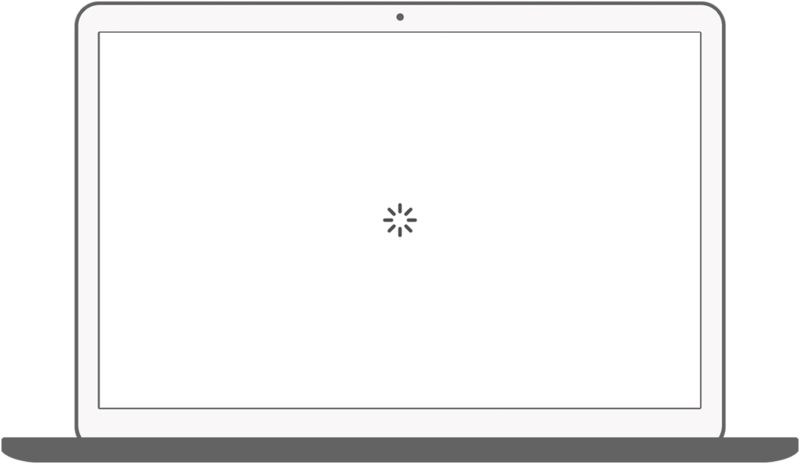 You will get a confirmation window on clicking "Cancel". Please note that the form can not be changed afterwards. The form is divided into phases. In the case of the 'medical treatment' form, you need to provide information about the victim, such as date of birth, job title and employment. Specificy the type of injury and its cause. Optionally, you can also report a description of the event, and add photos. Finally you are asked whether action should be taken. In the case of the 'medical treatment' form it will concern the victim of the accident. When you filled in all fields, you are asked to confirm that everything is filled in correctly. After completing a checklist or form, you will see a confirmation that the form has been received successfully. A form can also be rejected, the reason for this is reflected in the app. You can then adjust and resubmit the completed form. Set your preferences for receiving push notifications. The dashboard is only accessible to selected 'admins', for example local and regional managers. A clear overview of all forms: total, rounded forms, incomplete forms, etc. This data is displayed in real time. Within the dashboard you can filter by a specific region. Within the dashboard you can filter by a time period. A complete overview of all completed forms, including all relevant data such as form number, deadline, completion date and status. All this data can be exported as a csv file. User can sort the overview by date, reference number or type of form. Filter the overview by form type. The dashboard provides insight into the incomplete forms. Various forms can also be filtered within form categories. This is an example of the accident form, which shows the different accident forms in the drop-down menu. You can see the completed form details. From this screen, the forms can be approved or rejected. It is also possible to export the form as a PDF file. 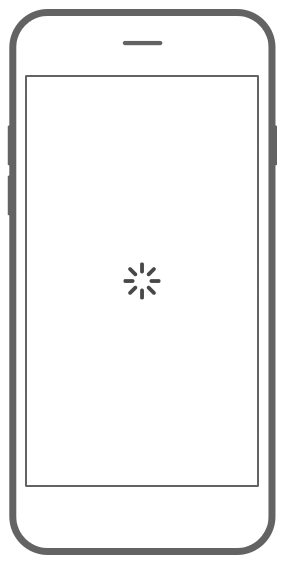 In this screen you can clearly see how many push notifications have been sent. Also, it is clear how many actually have / have not been delivered or opened. You can also search for push notifications. For each push notification that has been sent, you can see which users have or have not opened them.